Homeowners have two styles of hardwood flooring to choose from: engineered or non-engineered, which is also known as solid. The difference is that a solid floor is made from solid planks or tiles of a single species of wood, usually about 3/4 of an inch thick. Engineered flooring is made of three to five layers of plywood or wood fiber and stone dust pressure glued together and topped with a veneer of high-quality wood. They can come in thicknesses of 5/16, 3/4, 3/8 or 1/2 inch. High quality engineered wood has a relatively thick top layer. One difference between engineered and solid hardwood flooring is price. Some experts claim that engineered wood is usually but not always less expensive than non-engineered wood, and the installation is usually easier. However, there are experts who claim that solid hardwood flooring is actually cheaper because more of it is sold, and it’s often sold at a discount. So in short, if you know where to look you can usually find either solid or engineered hardwood at an affordable price. The layers of plywood in an engineered plank are laid perpendicularly to each other, which gives the plank great strength and stability. Because of this, engineered wood flooring bears up better under heat and humidity than solid wood and can be installed in the basement, kitchen or bath. It is also preferred for installation over radiant heating, though solid hardwood can be installed above radiant heating if it’s quarter sawn. Manufacturers recommend that solid wood flooring not be installed in the basement or in any other room where there’s high humidity. They also stress that wide planks of solid wood flooring be firmly nailed or glued to the subfloor to minimize movement. Solid hardwood flooring must be fixed with nails, staples or glue to a subfloor made of wood, a wood product or oriented strand board. The installer leaves a tiny gap between the planks and the wall to allow for movement when the humidity levels in the room are high. Engineered wood can be laid on vinyl or tile and on concrete as long as the humidity is not extremely high. It too can be glued or nailed to a subfloor, but the planks can also be nailed to each other and allowed to “float” above it. One benefit that solid flooring has over engineered flooring is it can be sanded then refinished many more times than engineered flooring. Repairing it is also easier. A solid hardwood floor can be refinished as many as 10 times, while the engineered wood flooring can only be refinished once or twice. Some low quality engineered floors can’t be sanded or refinished at all. Neither can floating floors, no matter their quality, for they’re not stable enough to get a good finish. Sanding and refinishing removes the scratches, dings and dullness of an old floor and allows fresh coats of sealant to be added make it look new. 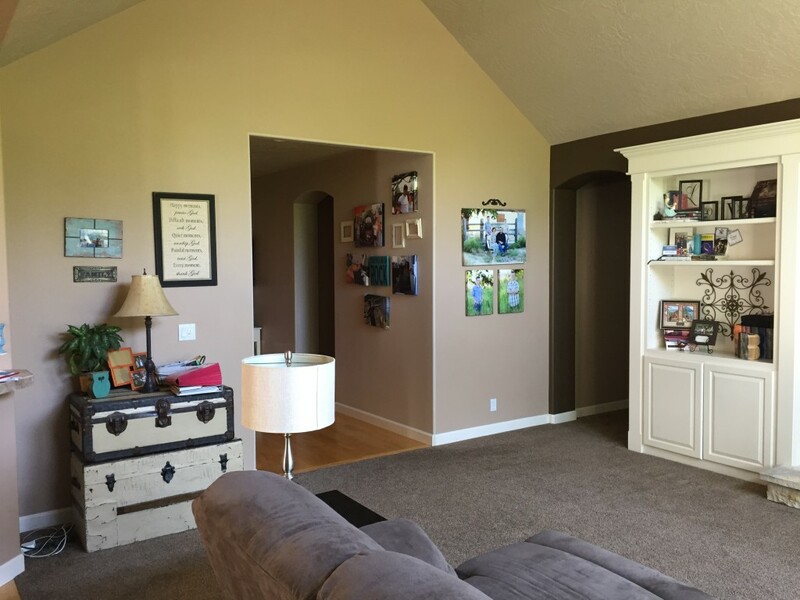 The ability to refinish the floor several times is important if the family has small children and pets and has no plans for selling the home in the near future. It’s also easier to find pieces of solid hardwood to match a floor that already exists. For example, if a wall of the house is taken out and reveals a gap in the floor, a plank or strip of matching solid hardwood is easier to find than that of engineered hardwood. Flooring experts claim that solid wood floors generally look better than engineered wood flooring. 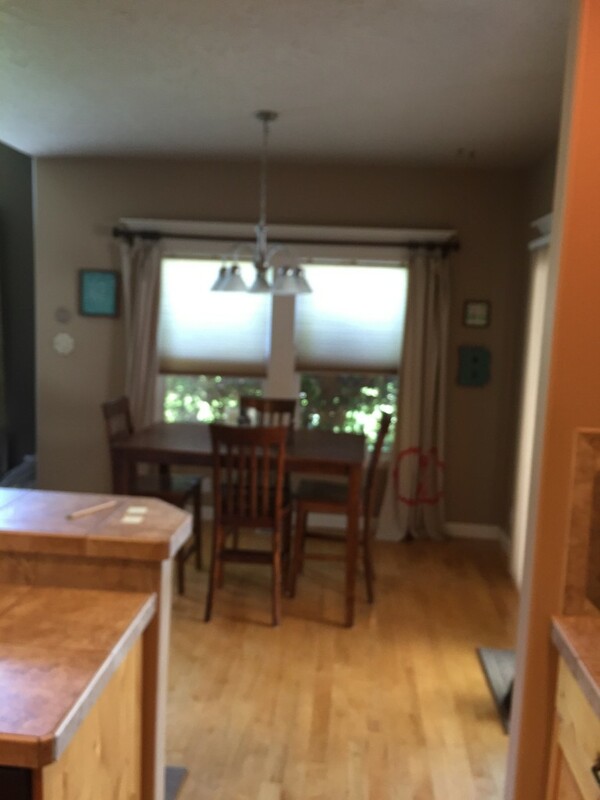 Because of this, a well-maintained solid hardwood floor adds to the resale value of a house. Though engineered hardwood flooring is made of real wood, if it’s not installed correctly, or if the floor is not level, it looks fake to some people. A floating floor can bounce in a way that people dislike. But engineered wood flooring’s stability allows wider planks to be installed, and some homeowners find wider planks attractive. Because engineered wood flooring doesn’t need to be installed on plywood, it is a good choice if the homeowner doesn’t want to add too much height to the floor. 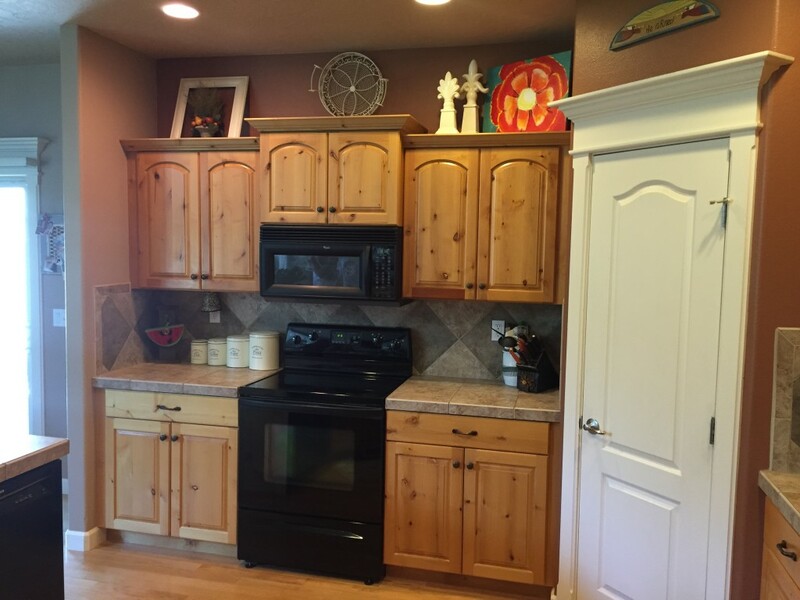 A floor that’s too high can impede doors opening and closing and make kitchen and bathroom floor cabinets uncomfortably high. Whether to install a solid or engineered hardwood floor is up to the homeowner and their budget. As can be seen, both have their strengths and weaknesses. But as both are made of real hardwood, both a solid and engineered hardwood floor can be beautiful and durable additions to a house. Jessica Kane is a writer for OSHA Campus Online, where you can complete a variety of OSHA training courses 100% online at your convenience. 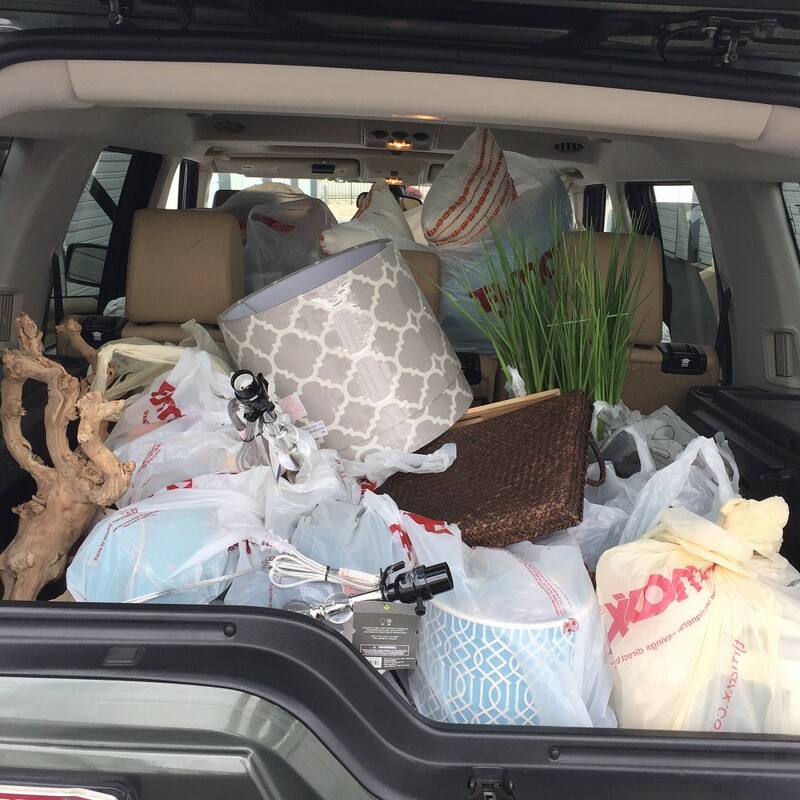 From Blueprints to Throw Pillows: The Anderson’s Build their Dream Home! 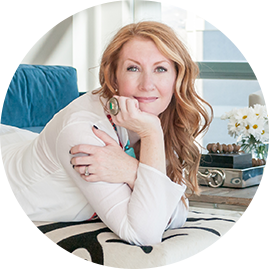 It’s every designer’s dream to get to work with a client from start to finish, helping them craft a dream home from blue prints to placing the final throw pillow. 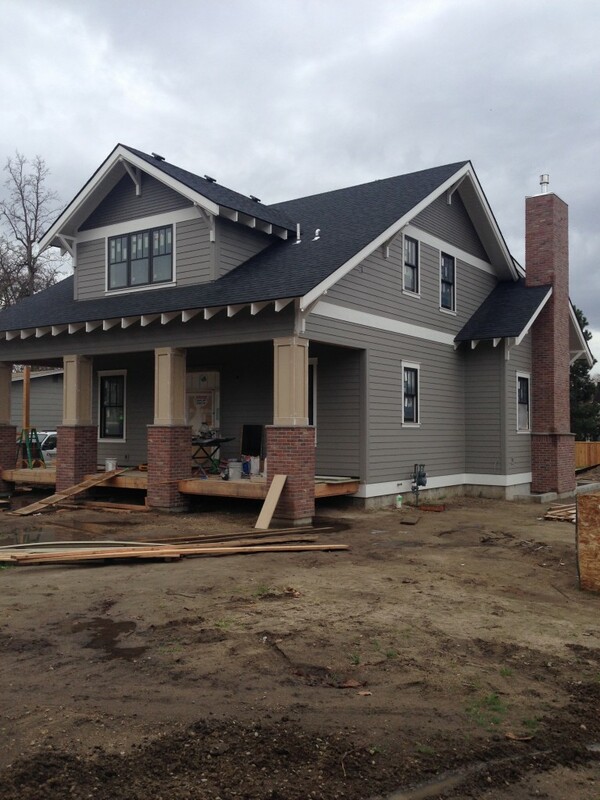 The Anderson family had purchased their dream lot in Boise’s North End, and had selected the perfect builders, Ogata Construction, (whom I use almost exclusively for all my remodels. They’re the BOMB!) 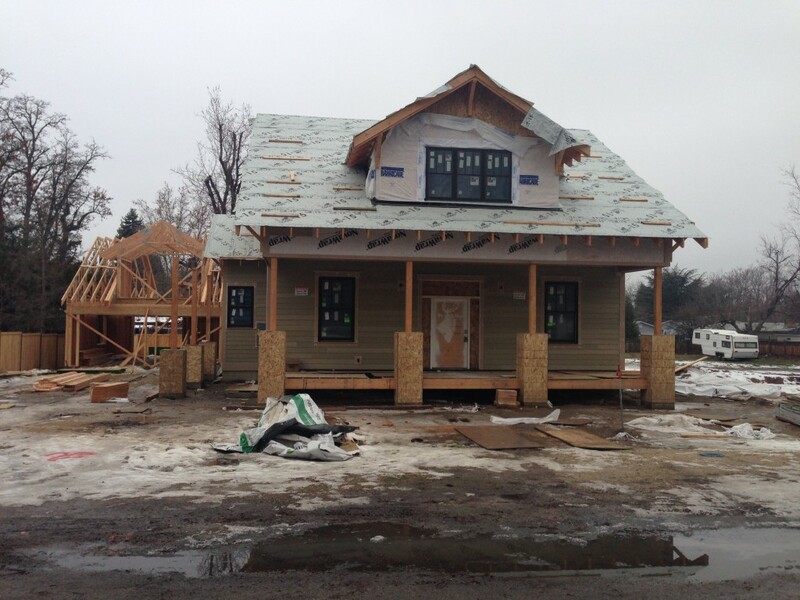 But then, like many homeowners building from scratch, the Anderson’s realized they were in over their heads. 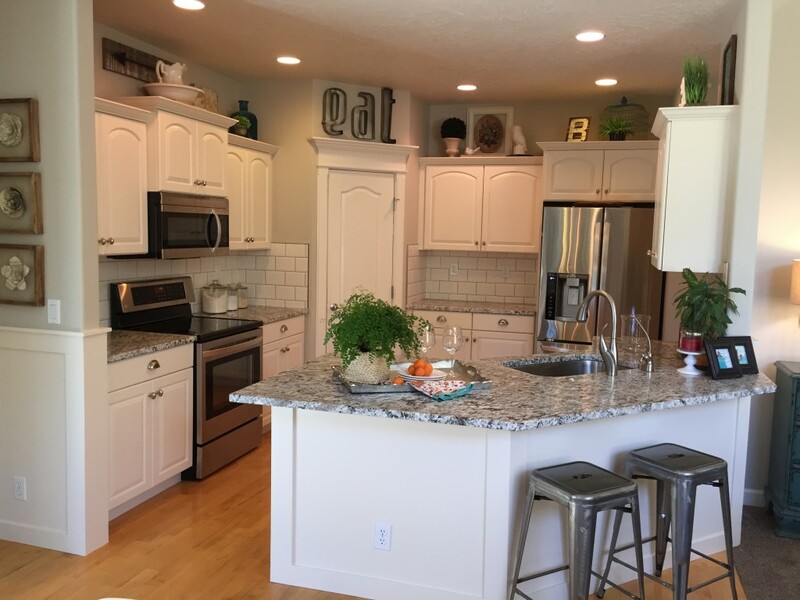 There are SO many choices to make–from flooring, to paint and trim color, to bath and kitchen finishes–all of which you want to be as timeless as possible, but also reflect who you are and what you love. 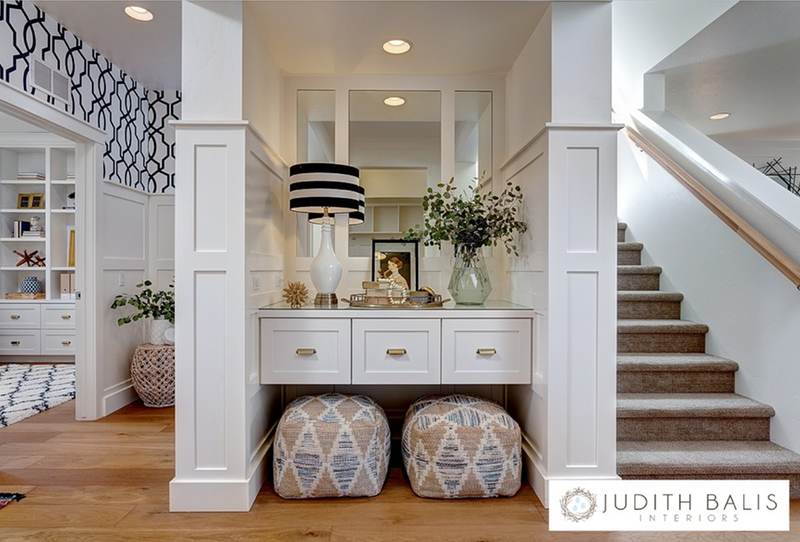 Making all of these selections is only the tip of the iceburg when building a house…there are also things that first-time home builders don’t even think about, like how their furniture is going to fit in the rooms for best flow and usage, what kind of lighting is best for each space and task, where feature walls should go, how door openings can affect the function of a space, and on, and on, and on… It can be a full time job, which is exceptionally difficult when you’re already working a full time job! So, to ease some of the stress, Ogata Construction brought me in to help. The Anderson’s and I clicked right away as we set to crafting their dream home together. First decisions to be made, the exterior. While neighborhood regulations may restrict you doing exactly what you want (like no exterior turquoise paint allowed), it’s ideal to consider how the outside of your home will blend with the inside. 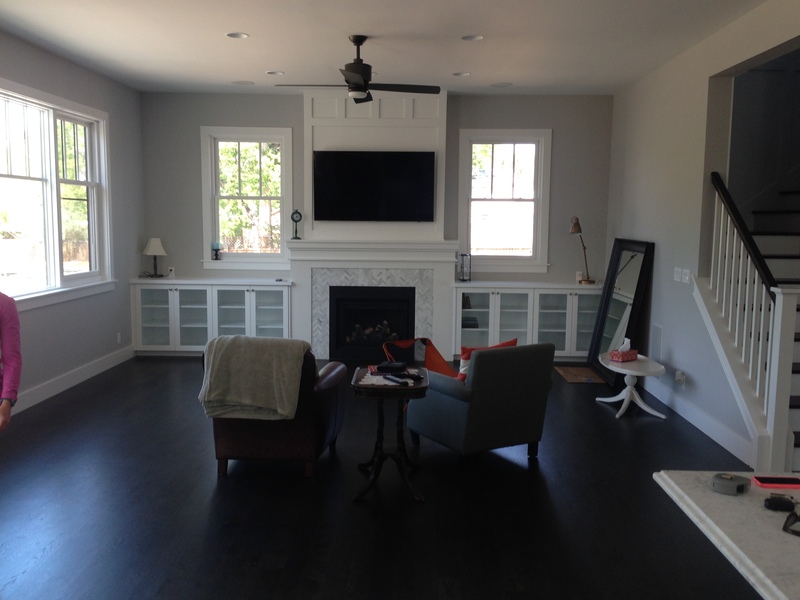 This gray (Sherwin Williams “Dovetail”), black, and white color palette was the perfect companion to the classic brick. It evoked the period of the architecture while still looking fresh and modern, and accented the homes gorgeous craftsmen bungalow-style details, such as the three-over-one windows. 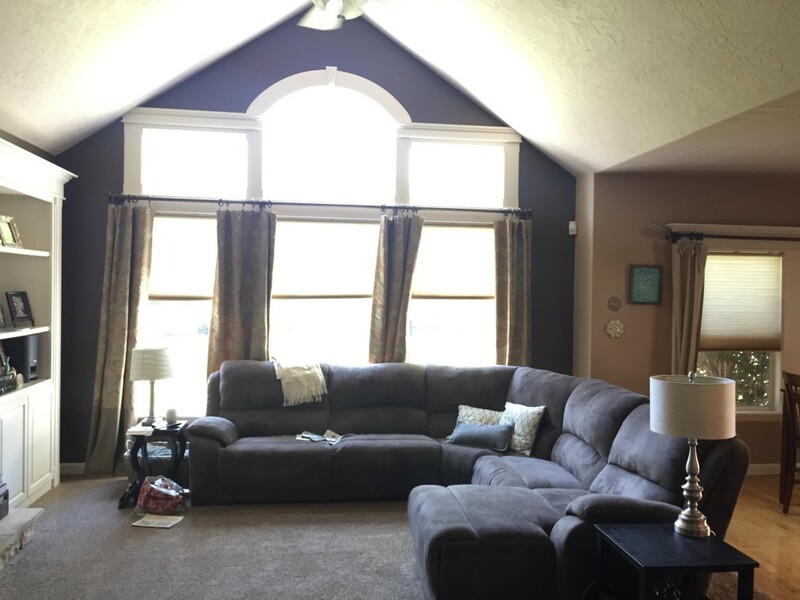 Once the outside was secured and in progress, we got to work choosing indoor colors and finishes that would harmonize from room to room. 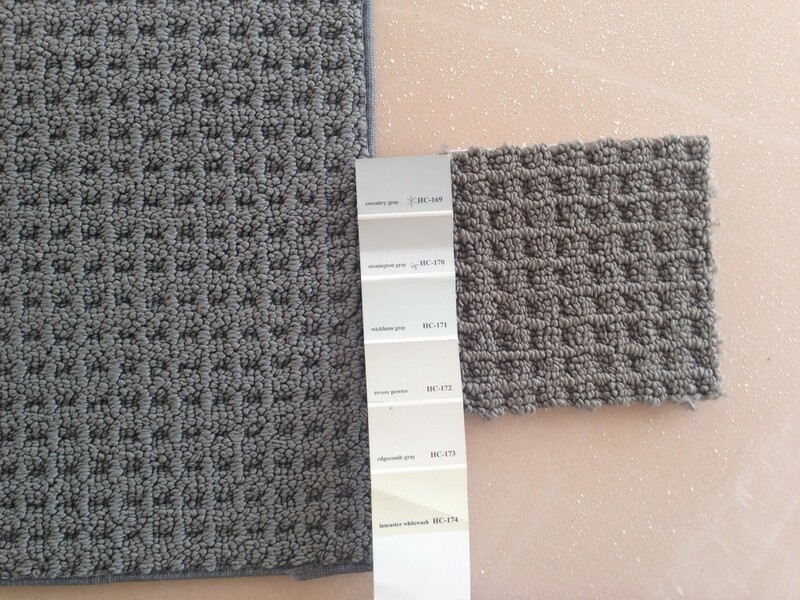 We picked from a range of grays with slight brown undertones. 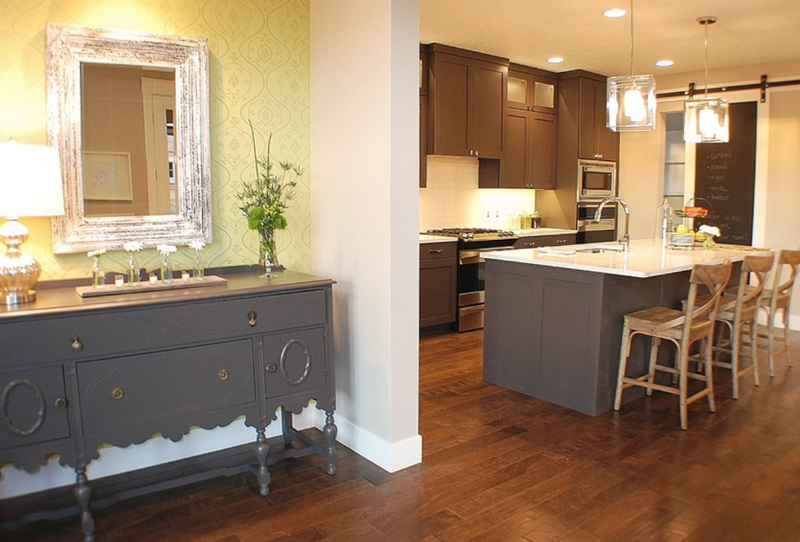 Benjamin Moore’s “Stonington Gray” was the winner. 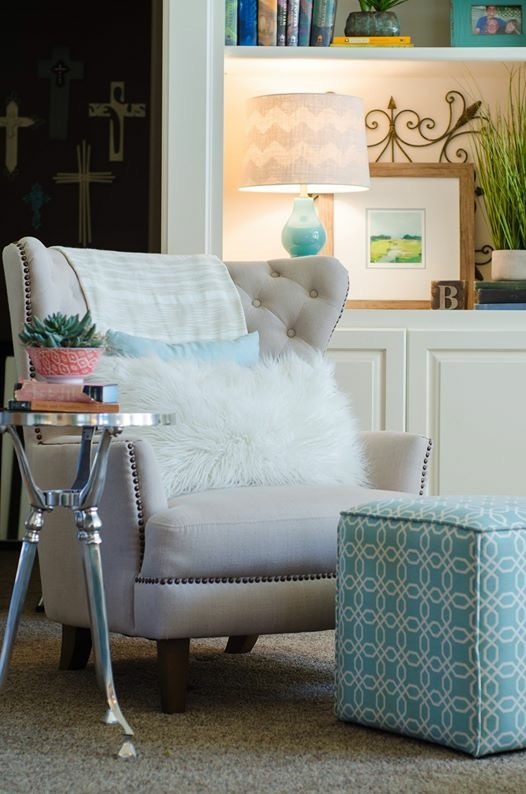 It is a subtle and fresh neutral that would allow us to play with a variety of bright fun colors when furnishing the space, and would also allow flexibility to change out accessories with the seasons if they desired. 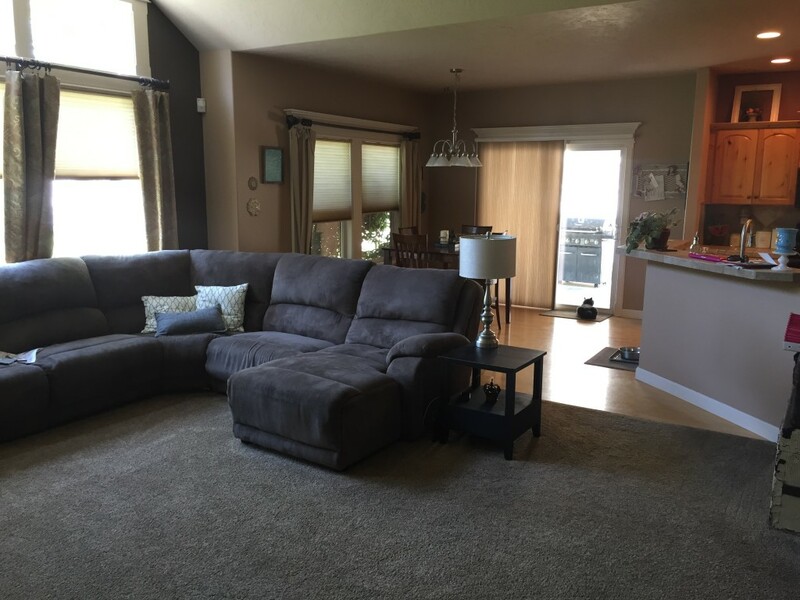 Where there were would be carpet, we selected a soft but sturdy Berber for this busy family of four, and a deep, dark, classic, espresso stain was custom blended for the hardwood. It was the perfect neutral backdrop for all of the FUN we would be adding later! 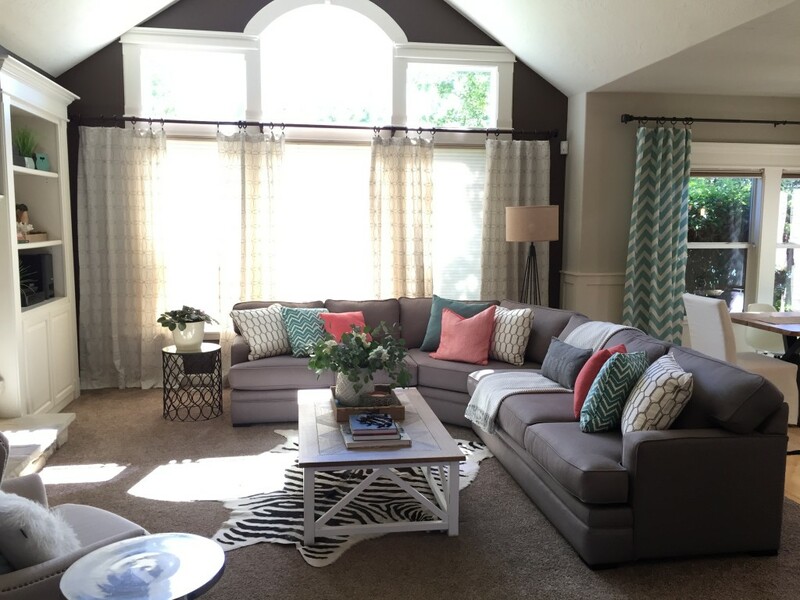 The turquoise, coral, and cream pop against the neutrals, allowing color to take center stage and breathe liveliness and fun into the room…but the neutrals also allow the Anderson’s the flexibility to change out their accent colors when they tire of these and are ready for a new perspective. 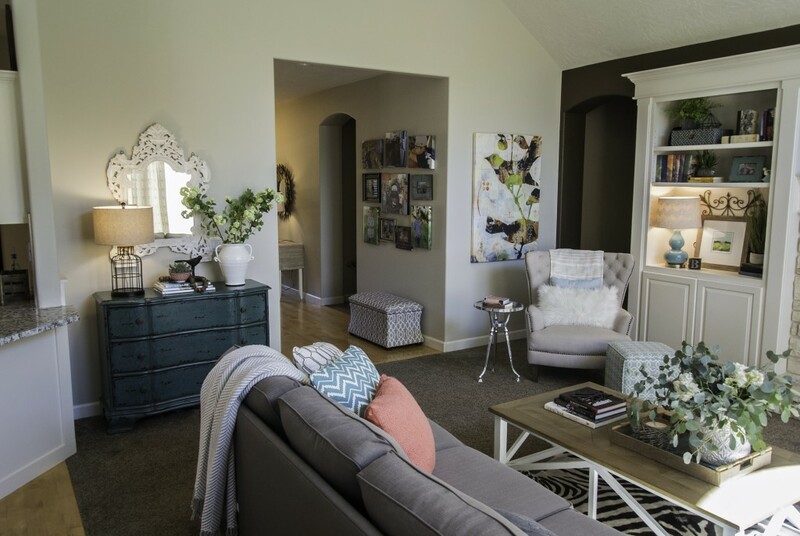 Curious to see how the rest of the Anderson home turned out? In my next post I’ll show you before and afters of their fabulous cottage kitchen with modern amenities, with future posts covering their jaw-dropping bedroom suite, mudroom, entry, and powder room. That’s where I team came in! We kept the carpet, but repainted the walls a lighter fresher shade (Accessible Beige SW7036), replaced the drapery panels (Bed Bath & Beyond), and ordered a new sectional from the Jonathan Louis Furniture (fabric color is “Dolphin”). 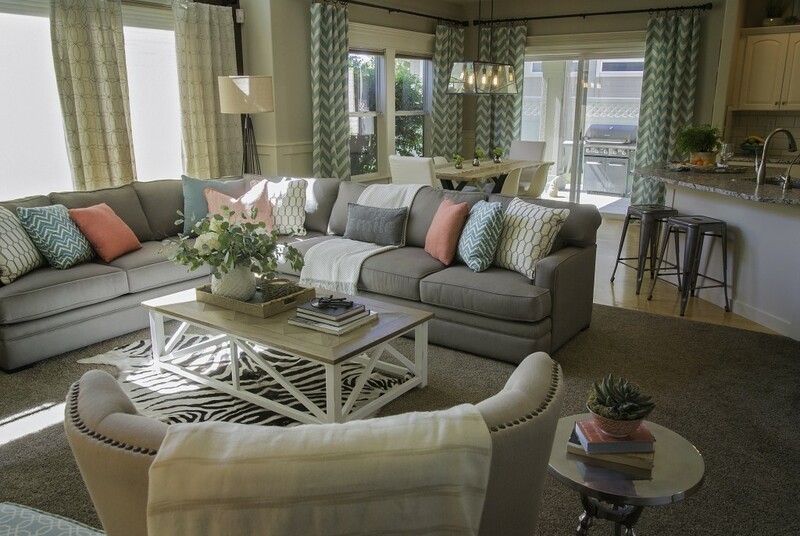 The coffee table is from Joss & Main, pillows are from Home Goods, chair is from Overstock, and floor lamp is from Cost Plus. 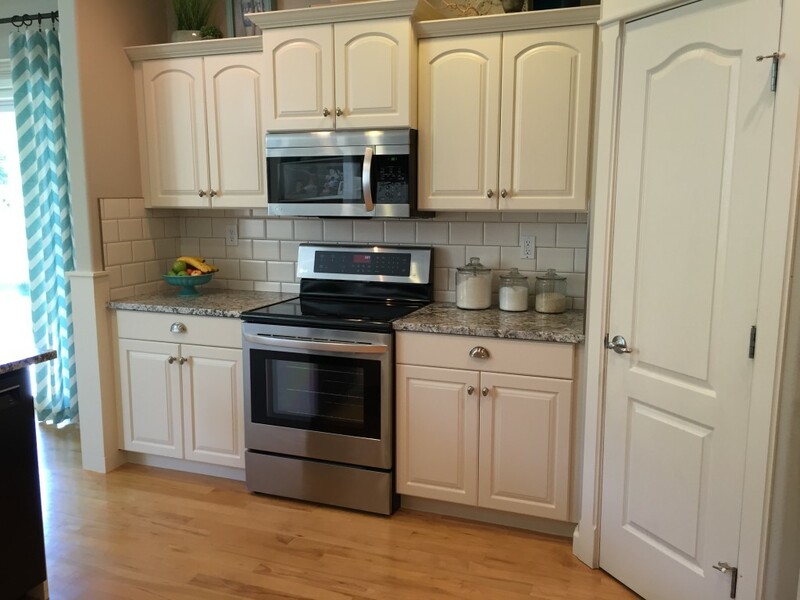 …so we painted their existing cabinets to save money, and replaced the counter tops, backsplash, and hardware, and swapped out the old black appliances for new stainless steel ones. MUCH better! We added shadow box molding to the walls to create architectural interest, lightened the wall color, and replaced the old drapery panels with something a little more exciting. 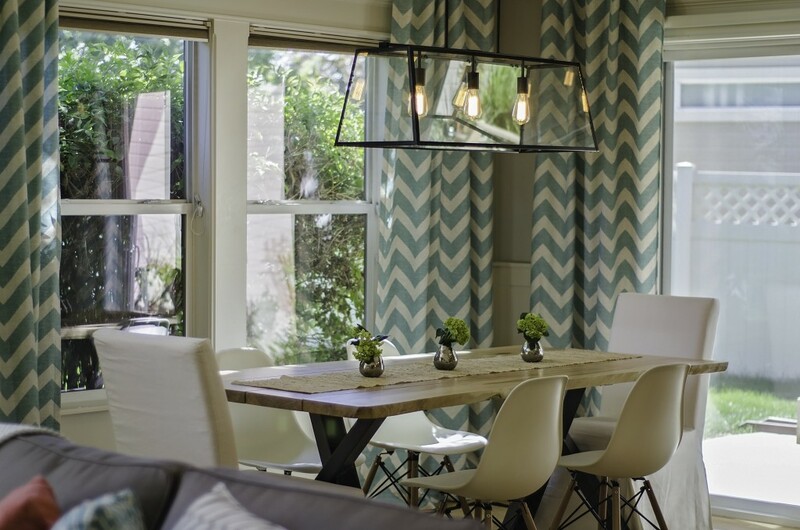 (hint for hanging drapery panels: I always hang them 12-16″ wider than the windows to help make the windows look larger.). Rug is from Overstock.com, slipcoverd chairs are from IKEA, side chairs are from Cost Plus, chandelier is from Ballard Designs, and table was found in the “scratch and dent” section of a local bog box furniture store for a fraction of the regular cost (and I have yet to find the flaw!). 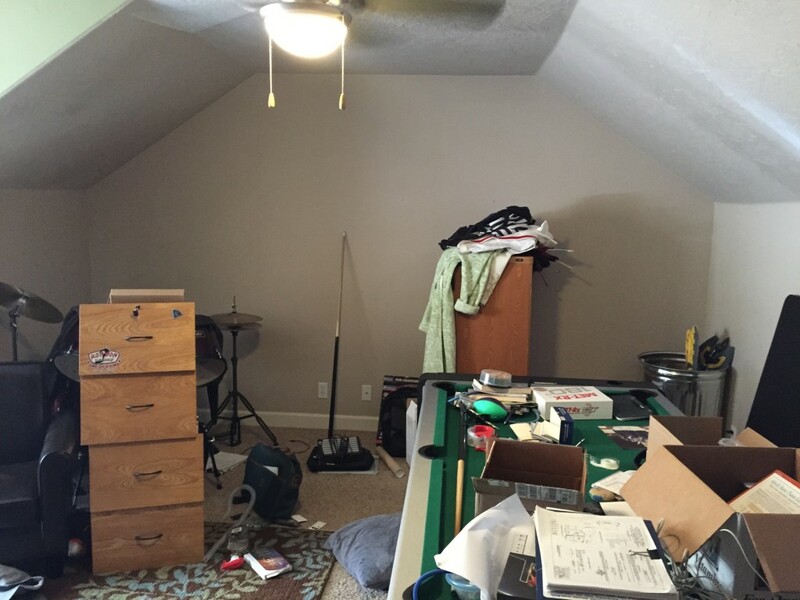 The last space on the list was the upstairs bonus room. 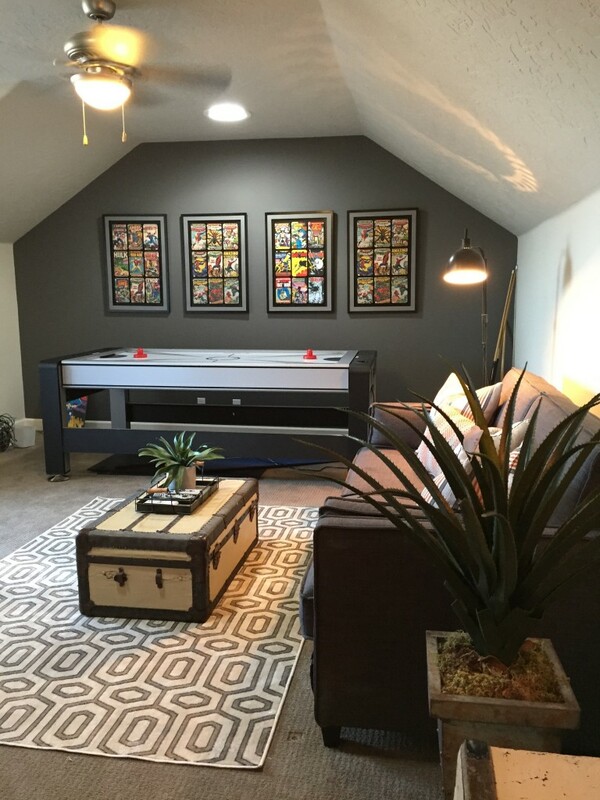 It was a room that needed to be a fun place for the two growing boys to hang out with friends and play video games, shoot some pool, or watch a movie. The boys LOVE marvel comics, so I painted the accent wall a deep charcoal gray, and found these awesome vintage inspired comic book cover replica art at Ross for $19.99/ea! 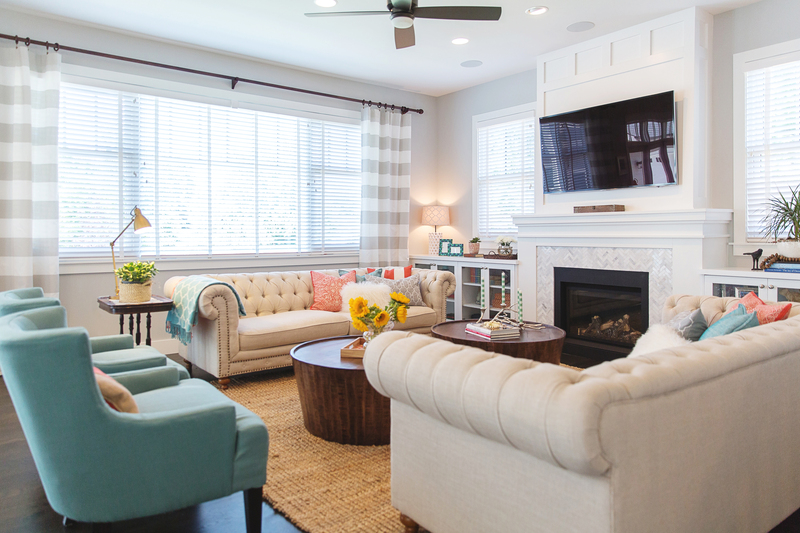 The rug and pillows are from Home Goods, the sofa (which folds out into a bed for sleep overs and extra guests) is from Cost Plus, and the trunk-turned coffee table was re-purposed from the family room. 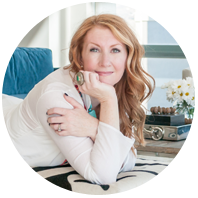 I am an Interior Decorator specializing in helping my clients get the uttermost bliss out of their design budgets, because EVERYONE deserves to live beautifully!